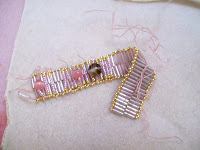 But since I've been beating my self up lately about not completing projects, I found myself in a beading quagmire. I'd gotten myself into this situation, and invested a bit of time, but I was finding extricating myself out of the situation (finishing) a bit difficult. And that's what I call a quality quagmire. That's a really beautiful bracelet! I like the colors you used together! Oh you so have to make a pattern! I love this one. Quality is not an issue for you because you make sure you love it and that is why your creations are so AWESOME!!! !